Matt Eagles – The man who doesn’t let Parkinson’s stop him. Ever. Living with Parkinson’s disease from the age of eight certainly hasn’t stopped Matt living life to the full. Over the years he’s jumped out of planes, abseiled town halls, photographed Team GB at the 2012 Olympics for ESPNSoccernet and is now working as a patient engagement lead to pass on his experiences of living with Parkinson’s. We meet Matt at his home, he sits opposite us talking about his school days. “The head teacher of my first school, Headley Cleaver, first noticed me falling backwards in assembly,” he said. At the same time he recalls having trouble at swimming lessons where his legs would just start to sink. Matt was referred to his GP Dr Fox who got the ball rolling and sent him to the Booth Hall Children’s Hospital. However it was a chance encounter at the local infirmary where the breakthrough was made. It was there that Dr Liversedge suggested to Matt’s parents that he try Sinemet, a drug for Parkinson’s disease. The tablets seemed to work, and more importantly from Matt’s perspective he was given 50p by the doctor for taking this bold step to try them out, unfortunately it didn’t stop Matt having some tough times at school. Over the years Matt has tried lots of drugs to control his Parkinson’s. He used to have to inject himself each day inserting a canula into his stomach and then attach a syringe driver which administered the toxic drug intravenously. The needle remained in place all day until he went to bed. “One of the drugs would work like Viagra,” he said, and would cause extreme startle, making him jump out of his skin when the phone rang, which was very awkward in the telesales arena where he worked. Another one of the drugs caused a potentially catastrophic Impulse Control Disorder to appear. “All of a sudden I started to gamble heavily and lost thousands of pounds. I realised something was seriously wrong and spoke to my consultant who took me off the treatment immediately. Pretty much over night the gambling subsided and the risk taking behaviour disappeared.” Just over ten years ago Matt had deep brain stimulation. He now has two electrodes that go into his brain and are powered by a battery in his chest. The implants control his stiffness and rigidity and can be remotely adjusted depending on the severity of the symptoms. Unfortunately he was made redundant recently and found it incredibly difficult, despite his experience, to find a job. “I didn’t want to think it, but the fact that I talked a lot about my Parkinson’s and the work I’d done around it on my CV didn’t help me at all.” He continued to do what he enjoyed, writing and photography, but as well as match reports he started to write about his experiences with Parkinson’s. He was sharing his experiences through Parkinson’s UK and on social media and it wasn’t long before he’d written more and more articles and was being interviewed a lot. He said, “I’ve appeared on Sky News, Sky Radio, daytime TV, Five Live, Radio Wales, World Service and I was featured in the Independent, Mirror, Sun, Express.” He is now working as a ‘patient engagement lead’, and an ambassador for Medtronic who manufacturer what Matt calls, ‘My brain pacemaker’. 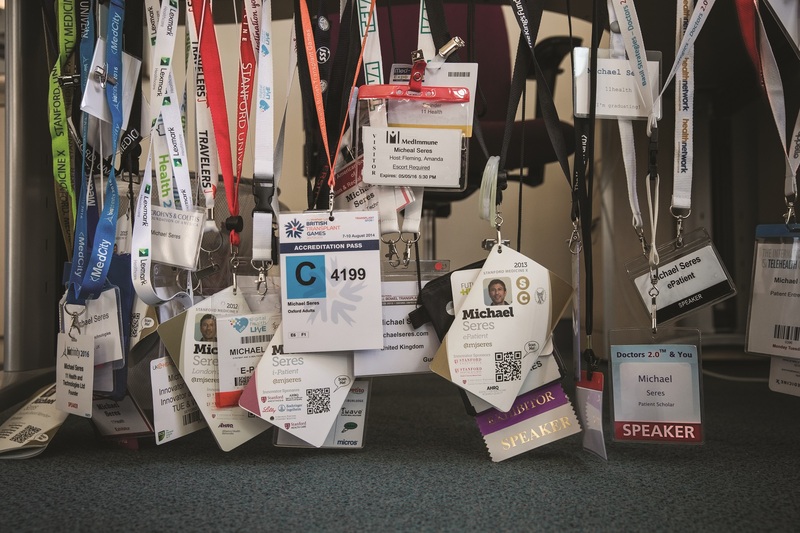 This entry was posted in General and tagged Healthcare Heroes, Innovation, Matt Eagles, Parkinsons, Success, The Passion Project on April 11, 2017 by David Hunt. At age 63, Steve Watts ran one of the world’s toughest marathons to raise money for charity. As if that’s not impressive enough, he was the first man to complete the race with a pacemaker. Steve vividly remembers an early project in school in 1963 when he was ten, learning about Hillary and Tenzing conquering Everest. He even remembers telling his brother, “One day me and you are going to follow in the footsteps of Hillary and Tenzing.” Then he paused, smiled and said, “More about that later.” Steve then took us on his life’s journey from that first school project culminating in his recent trip to the Himalayas with his brother Peter, sister-in-law Carla and son Matthew. Steve Watts is a runner, a fundraiser and a storyteller. He talked about, his time in the army and his job as a courier and salesman, but it was his running that had caught our attention. He said, “I remember reading about a chap called Joss Naylor who was a sheep farmer and fell runner, and amongst other amazing records, ran 72 lakeland peaks within 24 hours.” Steve was fully animated talking about Joss. He wrote to him and asked to meet him at his farm, saying he had a painting of Joss he wished him to sign. Naylor agreed and Steve went to Wast Water to meet him. It was the first time he’d been to the Lakes and standing at the bottom of the brooding grey Wast Water looking up to Joss’ farm, he instantly fell in love with the place. Joss came off the fell, took one look at Steve who had just finished a cigarette and said, “Thee lad, needs to stop thee smoking, lose some waaait and get on thee fells.” From that point on Steve packed in the fags, cut down on the booze and started fell running. 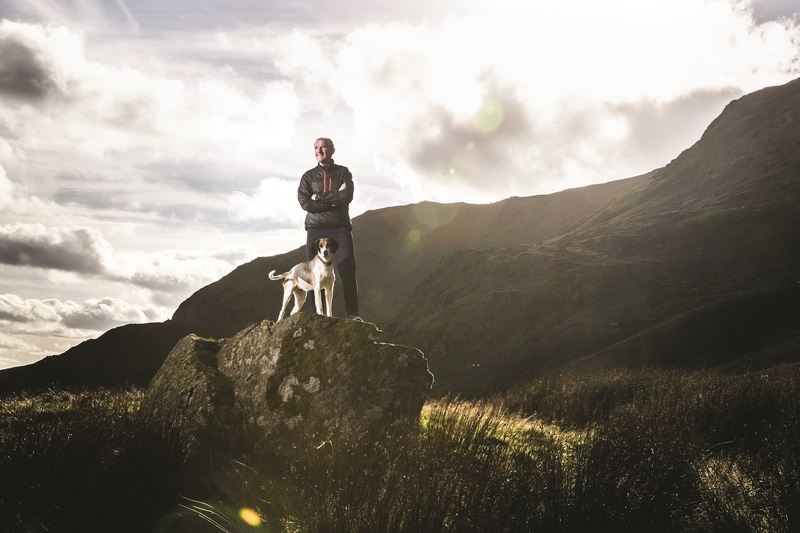 Three years into his running he attempted the Bob Graham Round with a friend but pulled out with severe cramps after 12 hours. The run gave Steve a taste of the immense challenge of top fell running. He was hooked. He attempted it the following year and made it….42 peaks and 72 miles within 24 hours. He picked up his Bob Graham certificate from Joss Naylor, which thrilled Steve and brought a wry smile from the sheep farmer. An article about his experiences appeared in a local newspaper and shortly after that he was contacted by Alan Jones, a work colleague. He asked Steve if he could help raise money for one of his neighbour’s children who was receiving treatment at Booth Hall Children’s Hospital and needed their own ventilator machine. So Steve decided to complete a 58-mile run with his dog. They did the distance in just over eight hours raising more than three thousand pounds. A number of months later Steve’s son Matthew was rushed to Booth Hall Children’s Hospital. While there Steve spoke to the consultant who remembered him from his previous fundraising feat, she asked if he’d be interested in helping them raise money for the scanner appeal. He agreed to help and was given a two-year secondment from his current employers to help raise the target of £1 million to pay for the first children’s CT scanner. He threw himself into the role and organised a number of large scale events. One such event called ‘Children running for Children’ saw over 7,000 children take part in a family fun run that was witnessed by thousands of people. The event raised over £130,000. In just 18 cram-packed months they managed to hit that amazing target. After reaching the total, the research and development team at Booth Hall asked Steve to stay on as the fundraising and events manager. While in the role, he set up Krypton Factor Assault Course events, ran the London Marathon and climbed Kilimanjaro as well as many other achievements. Steve spent a number of intense years as fundraising manager for the research and development team at the children’s hospital, but decided to step back for a while concentrating on family life and, as he said, “get a normal job”. One day though, in his late 50s he fell ill and subsequently had to have a pacemaker fitted. Lying on the medical table he said, “All I could think about was my brother who’d died of a heart attack only four years earlier.” He thought he would never run again, but with excellent medical support he slowly made the road to recovery. Steve said, “The pacemaker gave me another chance, a new lease of life. This is where Everest comes into the story. It was my 60th birthday and my younger brother Peter gave me a birthday card with a few numbers inside.” It turned out that these numbers were the coordinates for Everest’s base camp. The birthday present was for both of them to go to the base camp and then summit Kala Patthar in the land of the giants. What happened at Everest really affected Steve. After returning home he said, “I couldn’t stop thinking about the families that would be hugely affected by the loss of a loved one and the consequent lack of income.” This was when the fundraising bug re-emerged. “I promised to return and do the Everest marathon, raising as much as I could for the Himalayan Trust UK and the British Heart Foundation.” So Steve and his son Matthew set about raising money and organising fundraising opportunities under the name, ‘Heartbeat for Everest’. At 63 he would become one of the oldest people to complete the marathon as well as the only person to complete it with a pacemaker. Over the next year Steve spoke at lots of schools and in local papers talking about his experiences at Everest and his forthcoming record breaking run, and his aim to raise thousands of pounds for the two charities. Also on the trip whilst coming back from base camp with his family, Steve’s son Matthew noticed something which disturbed them all greatly. “Returning from base camp we were taking some pictures of Everest when Matt noticed a body lying in a gully below.” Steve ran down to discover a porter hunched over in the foetal position, suffering from hypothermia. They managed to get him out of the gully and back to the village further down the valley. Steve said, “When the porter came back to his senses, his first thoughts were to get back up the mountain and grab the load he was carrying. Without that he wouldn’t get paid and couldn’t feed his family.” He was in no state to go anywhere so Steve talked to a number of marathon runners in the camp, they managed to get some money together to pay for the porter’s medical bills and enough to see him safe so he didn’t have to get back up the mountain to fetch his load or work for a month. This entry was posted in General and tagged Fundraising, Healthcare Heroes, The Everest Marathon, The Passion Project, World Record on April 3, 2017 by David Hunt. In July 2015, Professor Paulo Stanga conducted the world’s first implant of a bionic eye. The pioneering technology means that patients who are completely blind are able to see for the first time, using technology which sends wireless signals between the brain and an implant in the retina. 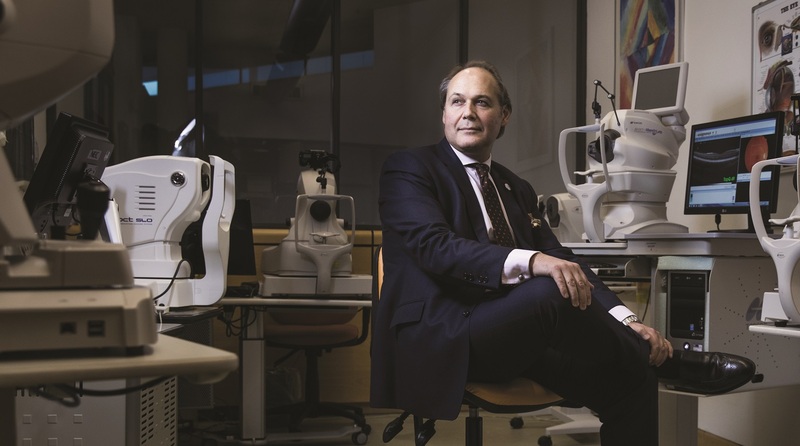 Professor Paulo Stanga conducted the world’s first bionic eye transplant in July 2015, marking the beginning of a new era for patients with sight loss. Over its 200-year history, Manchester Royal Eye Hospital has been home to a wealth of pioneering individuals who’ve pushed the boundaries in eye care. One such individual is Professor Paulo Stanga, who carried out the world’s first implant of an artificial retina, popularly known as a ‘bionic eye’, in patients with Age-Related Macular Degeneration (AMD). After New York, Paulo worked in London and Liverpool before settling in Manchester in 2003. “The opportunity was brilliant, the role gave me a chance to set up a team around my research and push on with pioneering trials.” After introducing, amongst others, new imaging and retinal laser technologies as well as treatment techniques into clinical care, in 2008 Paulo started setting up trials with the bionic eye. He worked closely with a US company called Second Sight who produce the Argus II Retinal Prosthesis System also known as the bionic eye. The initial trial focused on the implantation of the bionic eye for complete blindness in Retinitis Pigmentosa. He subsequently set up a pilot study of the bionic eye system in Dry AMD, one of the most common forms of severe loss of central vision, which affects 20-25 million people worldwide and 44,000 more people per year in the UK. The condition causes an impairment of the central vision resulting in people being unable to discriminate faces, read or drive. The world’s first surgery on a patient with this condition was completed by Paulo in 2015 on 80-year-old Mr Flynn, whose central vision had completely disappeared. The procedure involved attaching the implant within one of Mr Flynn’s eyes. This implant receives its visual information from a miniature camera mounted on glasses worn by the patient. The information is then transmitted wirelessly to a receiver that sits on the wall of the eye and from which the information is transferred to an array of electrodes that sits on the surface of the macula where they stimulate the remaining cells and replicate the patterns of light and darkness for the brain. The surgery was a huge success and less than two weeks later Mr Flynn was able to detect patterns of horizontal, vertical and diagonal lines on a computer screen using the newly acquired central vision provided by the implant. Paulo said, “Over time Mr Flynn is learning to interpret these patterns of light and darkness and regain some central visual function.” The implant itself cannot provide any detailed vision but it can help patients to detect distinct patterns such as door frames and shapes without having to rely solely on their peripheral vision. Paulo praised all patients who are taking part in the trial. These unique trials are only taking place through the Manchester Vision Regeneration (MVR) Lab at the Manchester Royal Eye Hospital and NIHR/Wellcome Trust Manchester Clinical Research Facility, as well as an independent Retinal Clinical-Research Fellowship Programme which Prof. Stanga set up in 2010 to contribute to this and other research. He said, “I couldn’t do any of this without the support of my team and the understanding of my family.” His fascination with the eye and his continued interest in how high end technology can help the medical industry allows Prof. Paulo Stanga to seek out solutions that haven’t been trialed or even thought of. He’s building a strong team and continues to treat patients with career defining surgery, improving the vision of many and in some cases restoring some visual function and helping patients to live more independently. This entry was posted in General and tagged Healthcare Heroes, Innovation, Manchester, Manchester Digital, Surgery, Technology, The Passion Project on March 28, 2017 by David Hunt. This week’s #HealthcareHeroes are Neesha Gobin & Catsou Roberts. They are the inspired people behind Vital Arts. An organisation that is transforming our hospitals by delivering arts projects for the well-being of patients, staff and the wider hospital community. The team work in partnership with medical staff, artists and cultural organisations to devise and deliver therapeutic creative programmes – workshops, artist-in-residencies, exhibitions, installations and public art commissions – that support medical goals; enhance patient well-being; provide continual professional development opportunities for staff; and create stimulating and uplifting spaces for patients, staff and the wider hospital community. A sterile labyrinth of corridors and clinical rooms void of personality make hospitals scary places to visit for the majority of people. Vital Arts are looking to change that experience by transforming spaces, engage patients and make hospitals a better environment for all. Vital Arts deliver arts projects for the well-being of patients, families and staff. 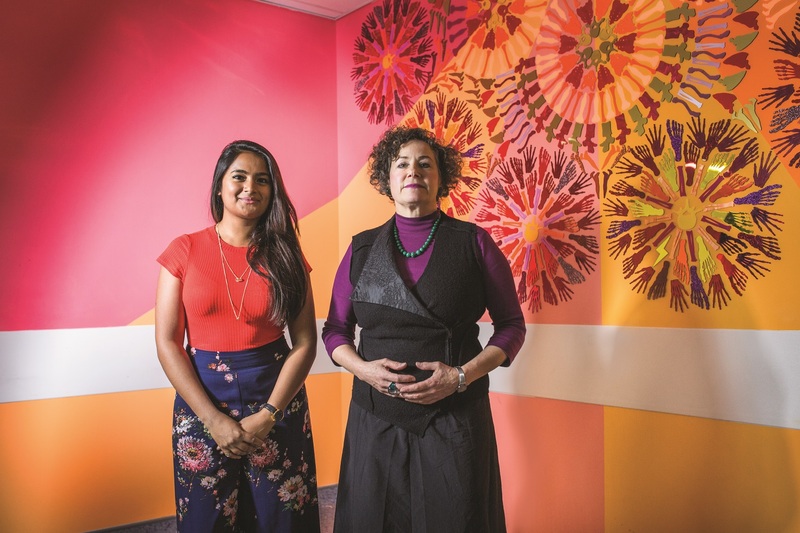 We meet Catsou Roberts, Director and Neesha Gobin, Arts Manager in a hospital that has three towers, the highest of which has 14 floors, with 675 beds, 110 wards and 26 operating theatres. This is a lot of space to fill with work by professional artists, and it is just one of the five hospitals that Vital Arts deal with. Walking through the revolving doors at the entrance we are hit with a flood of colour in geometric shapes reaching up the walls on tiles designed by renowned artist Morag Myerscough. The space immediately feels brighter, more welcoming and a whole lot more interesting than any hospital we’ve ever been in. Neesha greets us at the entrance and explains, “Because this is the Women and Children’s entrance we wanted to create a space that is bright and welcoming and Morag’s work does just that.” Vital Arts, established 20 years ago, is charitably funded and raises money for all its projects. They set out to commission site-specific, permanent artwork that has a real engagement with the architectural space, creating something unique for each designated area. Catsou added, “Our priority is to assist clinical aims and enhance the hospital environment, and this is an effective way to do that—as attested by our physio colleagues, and supported in many recent studies on arts in healthcare.” It’s clear to see the team are passionate about what they do. Catsou says, “I want to raise the standard of what art can be in hospitals.” They also want to act as a beacon encouraging other hospitals to be courageous, ambitious and discover new artists—not to just reach for off-the-shelf solutions by recycling artists who have already made work in hospitals. They are focused on delivering innovative projects, constantly pushing themselves and the artists to create work that is fresh, interesting and meaningful. There are hospitals around the world with empty walls, harshly lit clinical wards and intimidating operating theatres. They are places of work for professionals worldwide and are visited by millions of patients each year. What Vital Arts have done is special, it’s visionary, it opens artwork to a new audience that cleverly responds to the space it occupies and improves the patient experience within. Vital Arts have shown how some imagination can transform hospitals, making them less frightening and more uplifting. The team aren’t motivated by money, rather, they are interested in how they can offer life-changing encounters with significant contemporary art. What they do is create unique spaces which have a positive impact on everyone who spends time there. This entry was posted in General and tagged Community, Creativity, Healthcare Heroes, The Passion Project, Vital Arts on March 22, 2017 by David Hunt. This week’s inspirational Healthcare Hero is Tal Golesworthy, a former boiler engineer — he knows piping and plumbing. When he needed surgery to repair a life-threatening problem with his aorta, he mixed his engineering skills with his doctors’ medical knowledge to design a better repair job. 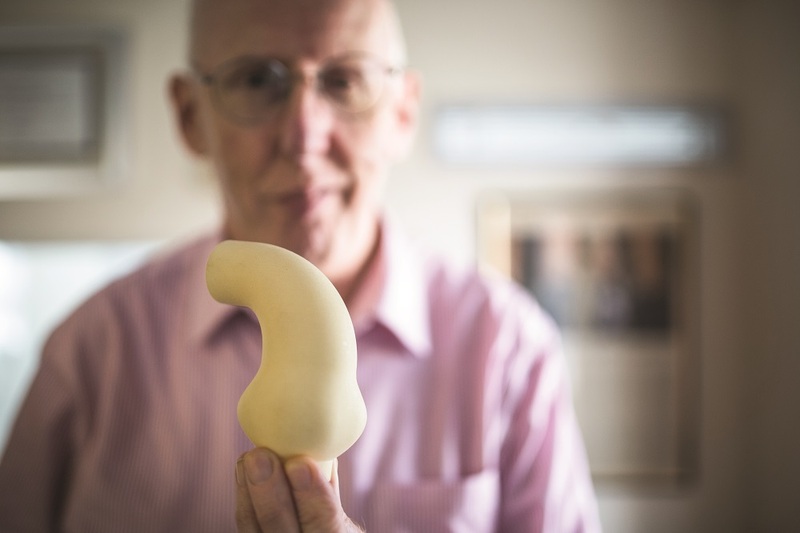 He has now founded his own company that funds the research and development of devices that will help people with aortic dilation avoid major surgery and lifelong drug therapy. “I’m being unwittingly emotionally blackmailed by the patients.” Tal bellowed with a wry smile on his face and a subtle shake of the head. “We’ve helped 78 people with the syndrome and have over 300 years of trouble free, post operative success, but still it’s like wading through thick mud trying to get the NHS to use the product.” But it’s these 78 success stories that keep pushing Tal every day, knowing the positive impact his invention can have. 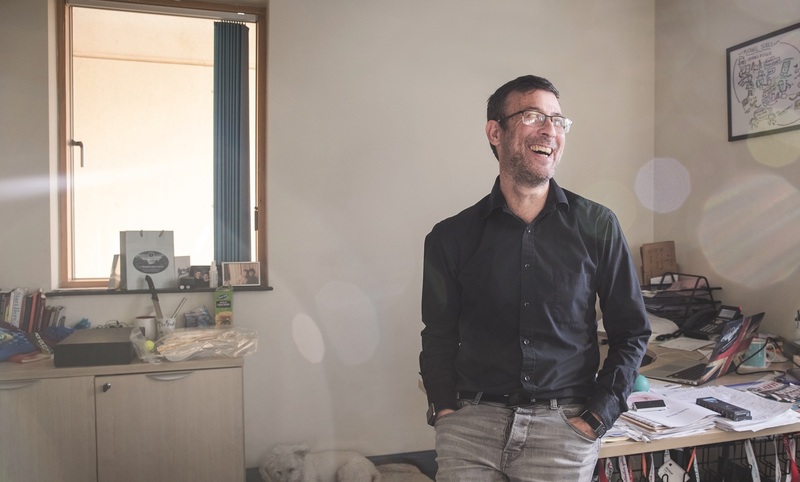 Tal Golesworthy is in his 50s, he’s an ageing rocker, a former combustion research and development engineer who has found himself in the medical world innovating new products because of a syndrome he’s had from birth. Tal has Marfan syndrome, a genetic disorder that can cause problems with eyes, skeleton, and in Tal’s case, his heart, more specifically his aorta. As the heart pumps blood around the body, the aorta stretches to accommodate the blood flow. In most cases it relaxes back to normal size but in Tal’s case it doesn’t, gradually enlarging over time. He’d known about the syndrome from an early age but a genetic study in 1992, found his aortic root diameter was significantly above the norm. This started an annual review process and in 2000 he was told the time had come to consider pre-emptive surgery. Tal scoured the net and sought advice from the best doctors and surgeons in the business. He wasn’t happy with any of the options available. “Traditional surgery dictated I have my chest cut open, a metal valve and prosthetic aorta inserted to replace my own aortic valve and aorta and then live on a blood thinning drug for the rest of my life. No thank you!” Tal’s research and development background meant he was well equipped to handle a medical project, so he set about researching everything there was to know about Marfan syndrome, the aortic valve and the complications of this medical procedure. He approached the project from an unusual angle. He thought that if a hosepipe is bulging, then you simply get some insulation tape and wrap it round the outside of the hosepipe to stop it bulging. So rather than replacement, his idea was to protect the current aortic root by surrounding it with a medical grade mesh. What started out as a side project became his full-time job and he set up a small team which over four years developed the various stages of imaging, CAD modelling, manufacturing, cleaning and sterilising the implant until they were happy to proceed. Part of that team was Prof. Tom Treasure, then at Guy’s Hospital London, and Prof. John Pepper, of the Royal Brompton Hospital, London. It was John who would be carrying out the first surgery on Tal. Tal said, “I had to trust this man with my life; I had total faith in John, I was completely happy with the implant, but that didn’t mean I wasn’t completely petrified.” The operation was a success, the implant fitted and there were no immediate complications. The breakthrough had happened, a procedure that took half the time of the current one, one which meant Tal wouldn’t be reliant on debilitating drugs and would allow him to go on and live a full life. He was ready to shout from the rooftops about this amazing new product that could save the NHS time and money and decided his time would now be better spent getting this product to market, allowing people to go on living life drug-free, through his company Exstent. The operation has been completed 78 times since that day, the youngest patient being 11 years old, the oldest, 56. There are currently over 30 publications written about the procedure in major journals, Tal talks a lot at medical conferences and his TED talk has had over one million hits. However this surgery relies on GPs and cardiologists offering the implants. “For me it’s more than 12 years post op and we’ve only done 78 patients. It’s a joke.” When you consider that with this cardiac problem there are approximately 2,000 operations a year around Europe that could benefit from the implant, it is easy to see Tal’s frustration. This frustration is shared by a lot of other inventors trying to break into a tough medical arena. He said, “All I set out to do was to fix myself. I didn’t set out to change the world, but I’ve found myself in a position where I’m trying to change a part of the world that is very resistant to change. If I had any sense I’d walk away, but it seems I don’t have any. 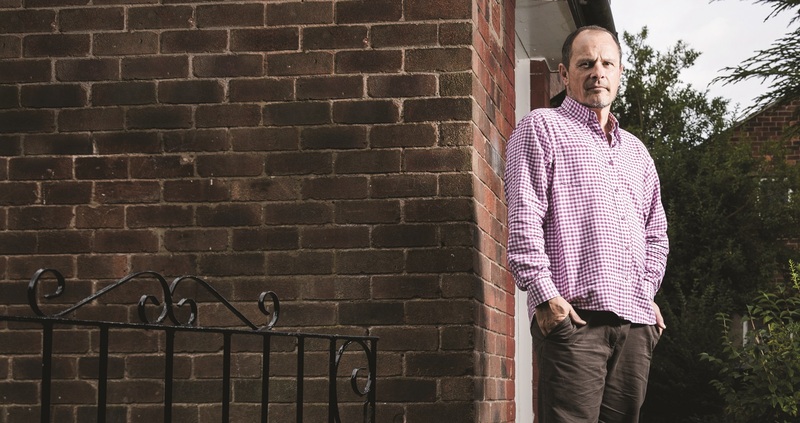 I can’t abandon those patients who want to exercise their choice of treatment.” It’s easy to see the desire Tal has, the passion that bursts out of him when he talks and the fact that his job isn’t a job, it’s a mission to realise the potential of an implant that can make such a positive impact on people’s lives. Watch Tal’s TED talk here. This entry was posted in General, Innovation and tagged Exstent, Healthcare Heroes, Patient Empowering, Surgery, Tal Golesworthy, The Passion Project on March 13, 2017 by David Hunt. Healthcare Hero Michael Seres has a remarkable story. At age 12 Michael was diagnosed with Crohn’s disease. Over time this condition continued to progress and his health deteriorated resulting in him losing a large amount of his small intestine. By age 40, where the average person has around five meters of small intestine Michael only had around 70cm. Michael’s only option was to undergo surgery for a small bowel transplant which came with huge risks. Not only were the odds of survival low, but the body may reject the new transplant. It was during the time that Michael spent recovering from this surgery that his story becomes even more noteworthy. Not only did he use the opportunity to educate tens of thousands of people around the world, he also developed a new piece of technology to improve the way he and others are monitored during recovery. After undergoing life threatening surgery, the road to recovery gave Michael a focus and an opportunity to help thousands of patients worldwide. The average person has about five metres of small intestine inside their gut, continually digesting food and absorbing nutrients and minerals. By the age of 40, Michael Seres only had about 70cm of intestine left. He had suffered from intestinal failure, was constantly sick and had to be fed intravenously for 22 hours a day. In order to get to the operation stage Michael had to undergo a wealth of assessments to ensure his body was ready. “The operation came round much faster than I expected. Three months after I was told I was going on the waiting list, the phone was ringing telling me to get down to the hospital for surgery.” The operation went very well and Michael had to spend the next nine months recovering in hospital. Shortly before the operation Michael started to write a blog. Initially he wrote it to let friends and family know exactly what was going on, but as time went on more and more people started to read it. His posts documented the rise and fall of living with Crohn’s, preparing for surgery, and then day-to-day living after the operation. To date it has had 60,000 plus visitors from medical students to Crohn’s suffers and even his transplant team. He said, “Four or five people have had successful transplants after reading about the procedure on the blog and suggesting it to their doctors.” Michael was only the 11th person to have the transplant in the country. Now they have completed 31. His first memory after surgery was waking up and feeling a stoma bag resting on his body. This small bag is used to collect the waste from the body and has to be emptied manually. Michael said, “It would constantly leak and the doctors wanted me to measure how much was coming out.” Michael had to rely on visually monitoring the bag to know when it was full, then he’d empty the contents into a plastic jug for the nurses to measure it and record the data on a chart. He thought that there must be a better way to do this. He used social media to contact other stoma bag users for their views, but the only feedback he got was ‘just get used to it’. Michael is keen to get as much coverage for his product as possible. He is currently pushing it in the EU and US and managing a team of 12 across both continents. When he was full of despair and in great discomfort, Michael couldn’t have dreamed that years later he’d be running a company which could aid Crohn’s sufferers, delivering keynote speeches, running workshops in the White House or becoming the first patient in residence at MedicineX, the world’s biggest digital health programme. Five years post transplant, he is in uncharted waters. He has moved past ‘just surviving’ and is fully embracing life, enjoying family time and pushing a product that he truly believes in. This entry was posted in General and tagged Crohns Disease, Healthcare Heroes, Michael Seres, The Passion Project on February 27, 2017 by David Hunt. John Jackson, a hospital porter, ensures that every patient that comes into his hospital feels at home. Sometimes, it can be something as small as simply introducing himself but John knows that these small gestures can make such a big impact on a person’s stay. His personal approach has not gone unnoticed. It’s resulted in many honours and awards for the compassionate care that he provides. 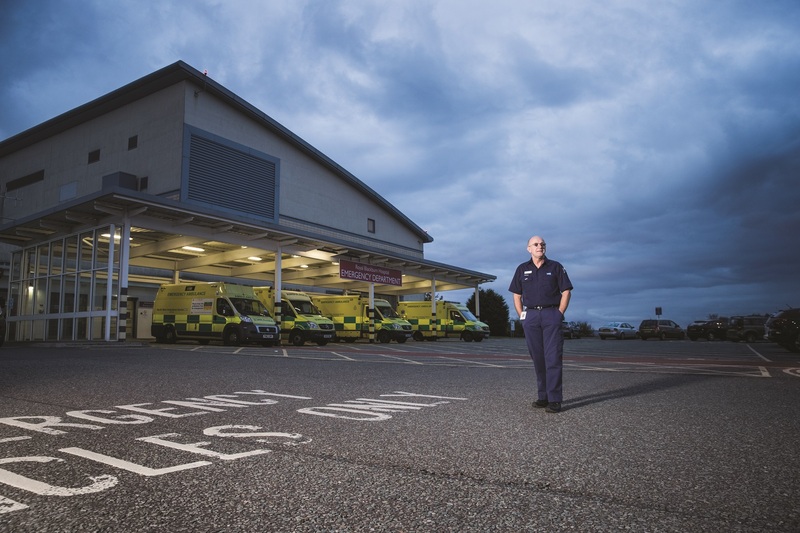 It’s always important to recognise that the individuals that go into hospital are people, not patients and John makes this his mission every day. Sometimes small gestures mean so much. The friendly smile when you feel down, the non-judgemental friend when you need to talk. John works as a night porter and provides both these gifts with ease. The sun sets behind the rolling hills surrounding Blackburn as we meet John in the cafe at the Royal Blackburn Hospital before his shift. His personal approach and friendly nature is one that has been recognised by many, from people on the street to organisations that have provided him with various honours and awards. John said, “I was on the bus the other day and a chap said, ‘I remember you. You helped my dad when he was in the ‘Royal’. Thanks for that mate.’ Those things mean a lot you know. I’m not a nurse or a surgeon performing life-saving procedures, but when people remember you that’s really nice.” He has also recently been presented the coveted Kate Granger Award for Compassionate Care. This came about for a number of reasons but one important area is his work with the hospital’s Bereavement Steering Committee (B.S.C.). 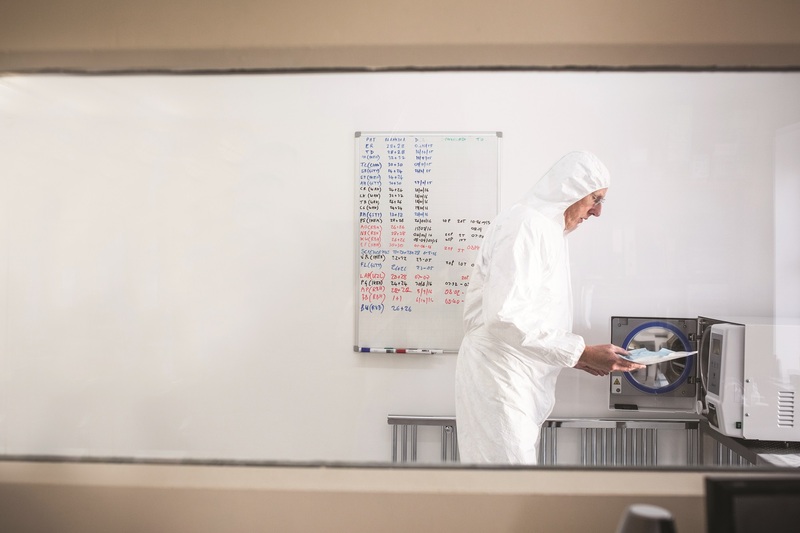 John worked previously as an engineer at Lucas Aerospace for 20 years before making the move to the NHS. He told us that “Being an engineer was fine but the last 15 years working here has flown by. I love it.” The pride he takes in his job and the smiles he carries with him every day is commendable. The little time we spend with him gives us a tiny glimpse of the work he does and the lives he touches. It goes to show that little gestures like a smile can be so important. In a job that can often go unnoticed in a large hospital, John shines like a bright light. This entry was posted in General and tagged #hellomynameis, Compassionate Care, Healthcare Heroes, John Jackson, Kate Granger, Royal Blackburn Hospital, The Passion Project on February 20, 2017 by David Hunt.